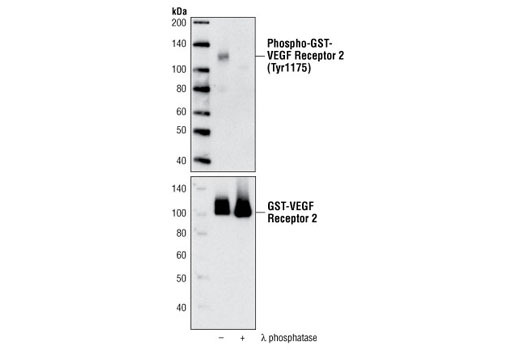 Western blot analysis of recombinant human GST-VEGF Receptor 2 (Val789-Val1356), untreated or λ phosphatase-treated, using Phospho-VEGF Receptor 2 (Tyr1175) Antibody #2478 (upper), VEGF Receptor 2 Antibody #2479 (lower). Boil for 3 minutes prior to use. Load 15 µl (20 ng) of phosphorylated and nonphosphorylated VEGF Receptor 2 Control Proteins per lane. Supplied in SDS Sample Buffer: 62.5 mM Tris-HCl (pH 6.8 at 25°C), 2% w/v SDS, 10% glycerol, 50 mM DTT, 0.01% w/v phenol red or bromophenol blue. Store at –20°C or at –80°C for long term storage. VEGFR2 Control Protein (Nonphosphorylated): Nonphosphorylated human VEGFR2 (Val789-Val1356) fusion protein treated with λ phosphatase serves as a negative control. Supplied in SDS Sample Buffer. VEGFR2 Control Protein (Phosphorylated): Phosphorylated human VEGFR2 (Val789-Val1356) fusion protein serves as a positive control. Supplied in SDS Sample Buffer. Vascular endothelial growth factor receptor 2 (VEGFR2, KDR, Flk-1) is a major receptor for VEGF-induced signaling in endothelial cells. Upon ligand binding, VEGFR2 undergoes autophosphorylation and becomes activated (1). Major autophosphorylation sites of VEGFR2 are located in the kinase insert domain (Tyr951/996) and in the tyrosine kinase catalytic domain (Tyr1054/1059) (2). Activation of the receptor leads to rapid recruitment of adaptor proteins, including Shc, GRB2, PI3 kinase, NCK, and the protein tyrosine phosphatases SHP-1 and SHP-2 (3). Phosphorylation at Tyr1212 provides a docking site for GRB2 binding and phospho-Tyr1175 binds the p85 subunit of PI3 kinase and PLCγ, as well as Shb (1,4,5). Signaling from VEGFR2 is necessary for the execution of VEGF-stimulated proliferation, chemotaxis and sprouting, as well as survival of cultured endothelial cells in vitro and angiogenesis in vivo (6-8). Dougher-Vermazen, M. et al. (1994) Biochem Biophys Res Commun 205, 728-38. Kroll, J. and Waltenberger, J. (1997) J Biol Chem 272, 32521-7.